Rex has known since he was a teenager that his neighbor, Gemma, is the one for him. But as a wolf shifter, he's been told that his life is too violent to bind himself to a fragile human. For the past eight years, he's been fighting in cage matches and trying to forget the woman who holds his heart. 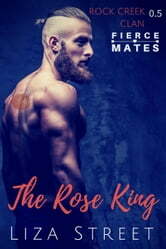 Now that Gemma has found her long-lost best friend, she can't believe he's the Rose King, a violent fighter. When cruel men want to control Rex, Gemma must confront the reason he left her, all those years ago. If she knows the truth about him, can their love endure? Content Warning: This shapeshifter novella stands alone and has a happily-ever-after. It contains liberal usage of naughty language and sexytimes and is intended for adults. It is 18,500 words, approximately 80 pages.